Since my husband has started eating (and enjoying!) Thai food, I jump on just about every Thai restaurant voucher that LivingSocial offers … That’s how I discovered Mee-Sen Thai Eatery. Order: My husband ordered the chicken Pad Thai ($9), and I was feeling brave enough to try the Crying Tiger Salad ($14) from their specials menu. The decor of the Mee-Sen Thai Eatery is very rustic … in fact, it what it reminds me of is what one might find as a seating area outside a food cart. It almost seemed a little too rustic … like they were trying too hard to capture a certain atmosphere, but not quite getting there. But really, the decor is the only thing about Mee-San that I found a little disappointing. The food is AMAZING. My husband enjoyed his Pad Thai, although it wasn’t his favorite Pad Thai that he’s had (he’s had it from three different establishments now), but he liked it. But the Crying Tiger Salad! OH MY! 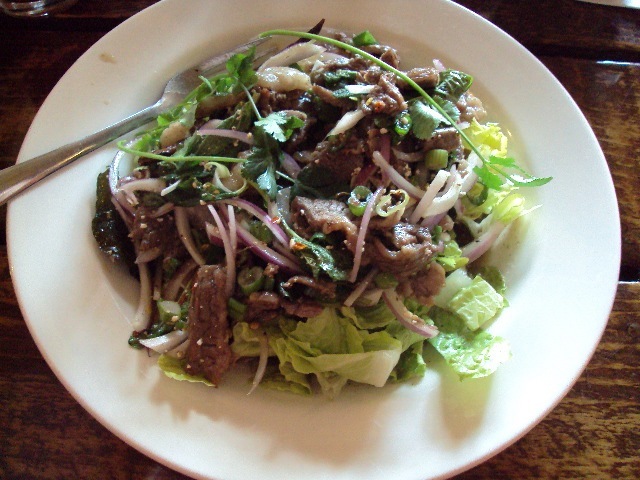 This is a romaine salad, topped with red onion, scallions, cilantro, Kaffir leaves, roasted chili, and lime juice, and then smothered with a thinly sliced, marinated rib eye steak. First of all, let me say that you should only attempt to eat this if you’ve the palate for spicy food. If you wear make-up, you should wear waterproof make-up when you eat this stuff. It makes not only the tiger cry but had me weeping as well. It as an explosion of flavor … not just hot and spicy, but, after the hot and spicy notes began to subside, my palate was treated to sweet and sometimes sour notes. The spicy often prevailed, of course. This was easily the most flavorful, interesting, and exciting salad I’ve ever had. It was not only an exploration of flavors but also of textures. The steak was super tender, it seemed to melt in my mouth. The vegetables were crisp, and a side of sticky jasmine rice came along with the salad. I found this to be especially nice at cooling the palate a little so that I could enjoy the other flavors of the salad. If you like Thai Food, you really MUST try Mee-Sen. Just writing this post and reliving the memories of the food there makes me want to go back. The food is absolutely delicious.